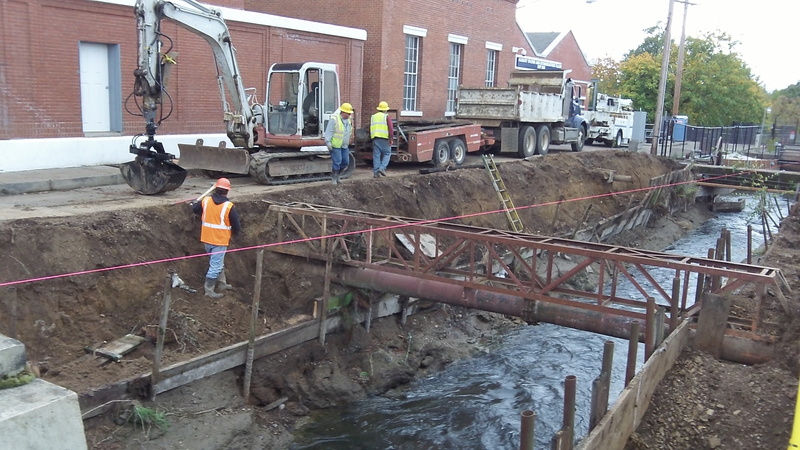 A contractor, Tornado Soft Excavation, works on a $265,942 project to repair the banks of the canal outside the Vine Street water treatment plant in Albany Tuesday. Albany and Lebanon are in danger of slipping into an un-neighborly fight over the Santiam-Albany Canal. Albany’s latest overture is not likely to help, and already the spat is costing Lebanon more money — on studies and options on land for a new intake — than it should have to spend. For my recommendation for resolving the dispute, read this story to the end. The 18-mile canal feeds Lebanon’s water treatment plant at about Mile 6. Twelve miles farther downstrean, at the Albany end, it meets a small part of Albany’s water needs and also spins the sometime generator at the Vine Street powerhouse. Here’s the problem: Lebanon wants to build a new water treatment plant. Albany won’t grant it a new intake location on the canal unless the cities reach an agreement on how much Lebanon should pay to help maintain the canal and to reimburse Albany for part of the costs of rebuilding the diversion dam and headgate and installing a fish screen in 2005 and ’06. Negotiations have run aground. Lebanon has taken steps to study developing its new intake on the river instead of the canal. Presumably it would have to meet regulatory requirements on fish protection and so forth. But if this is less expensive than staying on the canal, it would be wise to go ahead. Unfortuntely, the Democrat-Herald’s Steve Lundeberg reported on Facebook on some ill-advised banter during Monday’s city council work session. (I wasn’t there because I had another obligation for part of that time.) According to Lundeberg, somebody on the council joshed about maybe putting a gate on the canal and threatening to flood Lebanon as a way to encourage a settlement of the money dispute, and the public works director supposedly deadpanned that the city didn’t have the means to do that. Also on Facebook, Lebanon Mayor Paul Aziz and others in his town sounded miffed about that exchange. which I’m reasonably sure was meant in jest. This suggests two things: Don’t say stupid stuff at council meetings, and don’t let Facebook nonsense get you down. Given Albany’s tendencies to litigate disputes and act pretentiously, I don’t see this issue ending well. And joking about controlling the canal to flood Lebanon just exacerbates the ill will. We need new leadership at city hall. “I think there may be some misunderstanding about my proposal to the City of Lebanon regarding the canal. I suggested and the council approved a proposal for the City of Albany to contract with Lebanon’s consulting engineer to expand their scope of work to answer some additional questions regarding what would happen if Lebanon moved their intake from the canal to the river. I recommended this step as a way for both parties to get a clearer understanding of each other’s position. I had also hoped that our offer to use their consultant would serve as a demonstration of good faith on our part. It could also become the basis for a mediation/arbitration should we be unable to reach agreement in a less time consuming and expensive manner.